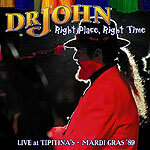 CD review: "Right Place, Right Time: Live at Tipitina's Mardi Gras '89"
The most visible example of the New Orleans pianist-singer since the 1980 passing of Professor Longhair, Dr. John's music is a piquant stew of all the influences that meet in the Crescent City. Blues, calypso, Cajun, country, jazz, gospel, Creole, R&B, reggae, classical  it's all there in every song that Dr. John (Mac Rebennack) plays. Nothing captures the full flavor of Dr. John like a live performance with a crowd to respond and prod him on. The second installment in "The Rebennack Chronicles" from Hyena Records finds the good doctor in a familiar haunt: the famed Tipitina's nightclub in New Orleans for Mardi Gras. While the first album in this series, 2003's "All By Hisself," featured Dr. John in a solo setting, on the new album he's performing with a six-piece band  including horns. The crowd is well-lubricated and receptive to the music's lilting rhythms, the band is tight, and the song list take in both the well-known ("Junco Partner," "Let the Good Times Roll") and more obscure tracks. The recording quality is fairly clean, Dr. John's playing is inspired  it's as good an example of the man's music as you'll find.